CREATE A VOICE Blog-ver-sa-tions: Wisdom Wednesday... Office Fun! Scenario: You clock in on time, Today's staff meeting is only an hour, after the meeting all supervisors, administrators leave for the day - Oh did I mention, the Boss is on vacation.... Simultaneously we all look at each other (smiling), What do you do? It's hump day, the boss is gone and when the boss is gone everyone else takes off and they leave the reliant in charge. Today the "reliables" will initiate OFFICE FUN! 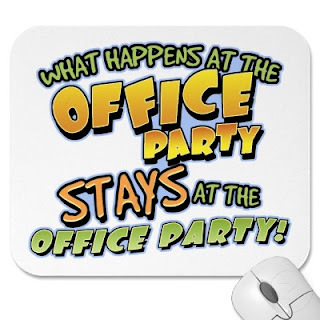 What is office fun /office-fun/ (verb) "it is the moment when management and mid management all are gone for the day and the remaining decide to relax while on the clock." Of course there is plenty of work needs to be done, but this day - We are going to turn on the radio, laugh loud, and send all calls to voicemail. We are going Ferris Bueller, in the office. Bottom line the worker deserves a paid fun day too, as supervisors and the bosses all take. Today we get 'paid sustainability stay.' We can utilize this day, to grow closer and engage in meaningful open discussions. Help a colleague catch up with their assignments, while working lightly and playing hard. The following are some suggestions, some may make sense or not...it's honest truth. Who will be the first to remove their shoes. This person sets the tone of comfortability. Being the first to remove the shoes is leadership. Here's some real advice. It's these moments when we decide to take an extra long lunch! So, Have it delivered! That way the shoes stay off and it's a win-win situation! Information is courtesy of a Google search landing us here. Which proves my point why OFFICE FUN, is so necessary given the opportunity. Never do anything to jeopardize your livelihood, but sense when it's time to regain yourself at the job, make'em give back to the community. HAVE FUN!